No man in MMA has ever done more by doing nothing than Nick Diaz. 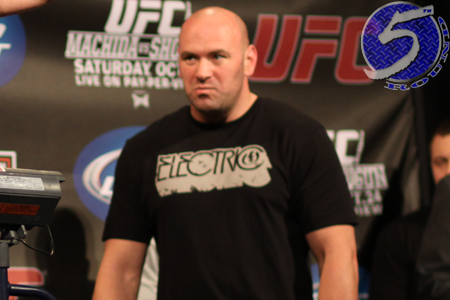 After he ditched back-to-back press conferences to promote a blockbuster bout with welterweight king Georges St-Pierre, UFC president Dana White (pictured) was forced too pull Diaz from UFC 137. Although, Diaz was granted a reprieve – following a year-long marijuana suspension, mind you – and will challenge St-Pierre for this throne this Saturday at UFC 158. However, Diaz returned to his old tricks by skipping three interviews for “Countdown to UFC 158” which reportedly cost White an additional $50,000 in labor fees. Oh, and the fun and games continue as we’ve entered fight week. Diaz no-showed for Wednesday’s media workouts, leaving dozens of press members, a hoard of fans and White baffled by his unexpected absence. “I literally just found out Nick Diaz did not show up for the open workouts,” White stated on “The Jim Rome Show” as all the madness was going down. “Let me tell you what, there is no schtick with this kid. I mean, he’s just a different animal, man. Diaz pulling his antics now isn’t as damaging as if he were donning a gold belt. However, if the controversial 29-year-old manages to overcome his 3.5-to-1 underdog status to serve up an upset special against St-Pierre, White will be forced to have another stern talk with the tardy one. Thursday’s pre-fight press conference featuring White, St-Pierre and Diaz is scheduled to begin promptly at 1PM ET/10AM PT – give or take several minutes to accommodate Diaz, of course. UFC 158 takes place Saturday inside Bell Centre in Montreal, Canada.